The lifelong hockey fan took a leave from his radio play-by-play job with the NHL's Washington Capitals to call the women's games for NBC Sports. 4:45 p.m. Wednesday, Feb. 21 update: Walton just emailed from South Korea to say his last game was the bronze medal women's hockey game earlier today. 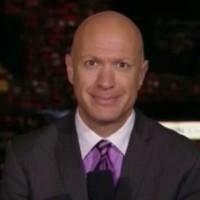 He says Kenny Albert will call the women's gold medal game (USA vs. Canada) at 10:45 p.m. tonight (Wednesday, Feb. 21) live on the NBC Sports Network and nbcolympics.com. Walton calls his last two games Wednesday, Feb. 21: The women's gold medal game (USA vs. Canada) at 10:45 p.m. live on the NBC Sports Network and nbcolympics.com, and the bronze medal game (Finland vs. the Olympic Athletes of Russia) at 2:30 a.m. (EST) live on USA cable. "I went to Badin in Hamilton (class of 1991), and absolutely watched the winter games during my time in Hamilton/Oxford/Cincinnati," Walton tells me in an email from PyeongChang. This is his first Olympics, after doing play-by-play of college hockey and Stanley Cup playoff games for NBC. NBC Sports called last September, and "when I heard the word ‘Olympics,’ I almost drove off the road,” Walton told the Washington Post. “I was thrilled that they called, I’m honored that they asked…. It’s going to be a trip of a lifetime” Walton told The Post before the games. Walton, in his seventh season with the Capitals, got his start in Cincinnati after graduating from Miami University in 1996. "I was the public address announcer at Riverfront/Cinergy Field from 1996-2002, and worked at 700 WLW (weekend sports anchor/helicopter traffic) for a year and half before I started with the Cincinnati Mighty Ducks at the Gardens. The Ducks games were on WVXU back then too," he says. Walton was the Ducks' broadcasting and community relations director 1997-2002, before going to the Hershey Bears hockey club in Hershey PA.
"To be able to be on the international stage, to be able to broadcast to a whole different, bigger, wider audience that tunes in every four years, and that may or may not watch hockey on a day-to-day basis … To be able to be a part of that in some way, I didn’t expect it, but boy am I sure glad that they called," he told The Post. "The only thing that would be better than this would be the Capitals winning a Stanley Cup."